THE TRUANTS is an apocalyptic vampire tale. It almost transcends the vampire subgenre. I say almost because there are some things that I didn’t care for within this tale. This is Lee Markham’s debut novel, and it shows throughout the story. With that being said, there are several things I really enjoyed about this one. The last old-one has decided to end his life, but before he can act he is held up at knifepoint. His assailant disappears, the knife in his pocket, the blood of the old-one seared into its sharpened edge. The knife changes hands several times throughout the book, infecting London’s inner-city youth. The funny thing about this book is the fact that the author never uses the term vampire–it’s insinuated. I thought that it was clever the way the story plays out, having the old-one resurrected through his horde’s consciousness, using them as vessels. He must find the blade to regain control of his soul. As the body count rises, the old one’s horde is being hunted by police and someone else who is trying to stop him. I thought the premise was great. The author did a good job with the setup and execution. It’s a gritty tale that is filled with inner-city decay and death. I liked the gritty London scene that the author created. I’m talking drugs, poverty, gangs, and more. The cover compliments the story nicely. You can tell THE TRUANTS is a debut novel. The characters actions felt clunky and mechanical. It felt like the author was commentating the characters every move. I didn’t like when the story switches from third-person to first-person. The storyline is smooth, though. There are disturbing scenes involving women, children, and animals. The author gives a new and refreshing take on the gothic tropes of vampirism. To me, the ending is the best part. 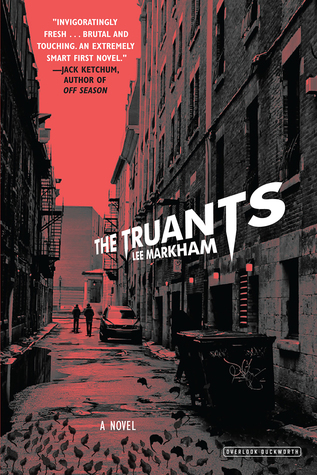 If you like apocalyptic vampire tales, then you should give THE TRUANTS a go.